If you are a member of Pier Group there is a forum to discuss and share content and ideas. Click the button and set up an account. 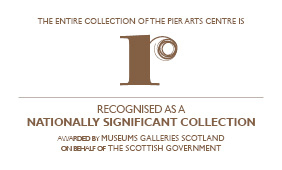 An important element in the Pier Arts Centre’s programme is the role that is undertaken by Piergroup – the gallery’s young people’s collective. As a group, they have identified and defined a set of key outcomes for longer-term, strategic engagement of young people with the Pier Arts Centre, including curating, mentoring and peer critique and volunteering. The group works closely with the Pier Arts Centre’s permanent collection of 20th & 21st century British modernist art and the Centre’s temporary exhibitions programme. The Collection provides the focus through which Piergroup activity is benchmarked and evaluated with the temporary programme introducing the group to current art practice and the opportunity to work with contemporary artists. Most recently Piergroup has worked with Jim Lambie (2011), Christine Borland (2012) and Nathan Coley (2013). To participate in Piergroup you need to be 15 years or older. Maintaining a thread of communication between senior students at local schools and artists emerging from Scottish and other Art Schools is a key part of the Piergroup philosophy. Several members of Piergroup have recently been involved in an informal mentoring programme run by gallery staff in the development and delivery of workshops for school-age children and a local young peoples’ group supporting those with additional support needs. Piergroup have curated several exhibitions, bringing a fresh and pertinent perspective on the relationship between the 20th century works in the Pier Arts Centre’s collection and the recent acquisition of works by Martin Boyce, Camilla Low, Douglas Gordon, Ross Sinclair, Callum Innes and Eva Rothschild. Piergroup provides a formative and extended period of professional development, practical experience and personal fulfilment as well as meeting the group’s collective identified objectives: Inspiration; Experience; Knowledge; Opportunity and Achievement. As part of a new generation of young and emerging artists and creative people, Piergroup, gain experience from working and consulting with artists, going on to develop outreach and community engagement programmes that promote and extend the reach of the visual arts in a collaborative, creative and revealing way. Since participation in a major learning project funded through Plus Tate in 2012, Piergroup has been enabled to devise and deliver programmes within the gallery and set the criteria for how these projects are assessed. Having developed skills in critical reflection and project management as well as an understanding of evaluation methodologies, their projects adopt the seven guiding principles (creativity, time, trust, flexibility, rethinking language, co-constructed knowledge and connectivity) developed by the Plus Tate project and further embed this form of reflective practice within the organisation.